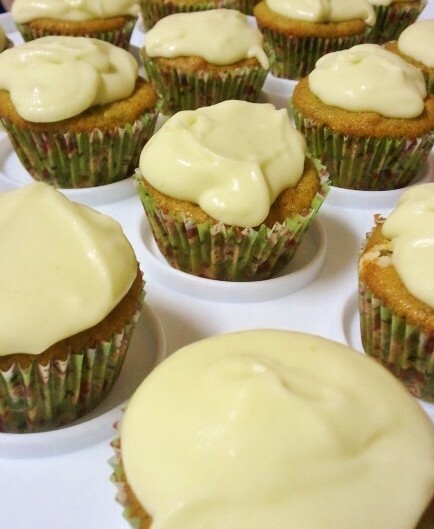 If you have been following my posts on the Facebook page (which you all should be *smiles*…So just click that link there *wink*), you know that I recently made some cupcakes that raised a few eyebrows. They were made with Avocado. Oh sure. Be like the majority of people I mentioned these to and turn your nose up in disgust. But, if you’re like me, and you truly believe that the avocado’s soul purpose on this Earth is not just for Guacamole, then this recipe is for you! It is delicious, and the icing could be eaten on a variety of items…from dipping a butter cookie into it, a fruit dip, to putting on other cakes and cupcakes. This is one you need to trust me on. And, I’ll be honest, since I didn’t have the highest hopes for this little surprise gem of a recipe, I didn’t get photographs throughout the process. However, I did take one before I carried them to work. If you haven’t figured it out yet by reading the above…everyone loved them! Please try…you won’t be disappointed! It seems like a lot of work (I’ll admit that fact), but it’s the prep that is intimidating. In the end it’s worth it, and the green tint to the icing makes for a perfect holiday treat. The recipe was found on this site…If you love Avocados, you might find many more recipes to try and tips to store your Avocados. 2 eggs – I used egg whites, and added 1 tsp. of oil per egg required as a substitute. ½ tsp. freshly grated nutmeg – for the spices…sadly, I didn’t have all of them, so I used the equivalent amount for the three, 1 1/2 teaspoons of Pumpkin Pie Spice. ½ cup walnuts, chopped – I used Pecans, but Walnuts would be much more perfect! 3 Tbsp. Fresh California Avocado, peeled, pitted, pureed – I just mashed the crap out of it. Cream together sugar and butter. Add the avocado and eggs and beat to incorporate. Mix in the buttermilk. Mix together the flour, spices and baking soda. Add them to the batter and mix well. Toss the raisins, walnuts and small amount of flour together. Add to the batter and mix in. Pour into mini cupcake pans lined with holders and bake at 350 until done and golden, about 15 to 18 minutes. Cool to room temperature before frosting. Beat together the cream cheese and butter until fluffy. Beat in the pureed avocado. Beat in the powdered sugar, sour cream and vanilla. Refrigerate. – I refrigerated mine overnight, and since it was a softer icing, just spooned a dollop over each cupcake and let it do it’s own thing. Shelf life of the frosting is 3 days. Previous Post Would you like some Pudding, Puddin’? Next Post Old Mill of Guilford – a great Foodie Adventure!